Real Estate Agency Enewsletter :: INHOUSE Productions Ltd.
Design and development of branded enewsletter. Monthly production of enewsletter with 10-12 articles linked from main content to each individual article and hosted version of enewsletter. 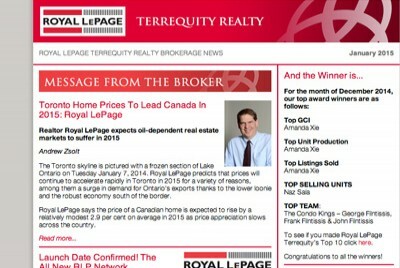 INHOUSE has produced this monthly enewsletter for Terrequity Realty since July of 20011. When Terrequity Realty aligned with Royal LePage, INHOUSE was tasked to rebrand the agency’s enewsletter with the Royal LePage look and feel. Rebranding completed in March 2014.